Ticonderoga simulates six engagements in the region between the upper Hudson and lower Lake Champlain, specifically the area between northern Lake George and Fort Carillon (a.k.a. Ticonderoga) during the French and Indian War (1755-58). The game system emphasizes the importance of leaders, and highlights the role of individual command skills, circumstances and luck. 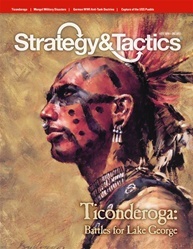 Throughout the game, leaders’ skills are tested as their units maneuver and fight, and every leader has the capacity to be “inept,” “capable” or “exceptional,” varying from engagement to engagement. The game includes a lot of randomization; so every game may vary in tempo. One game may involve more soldiers than another, and often the quality of the lower-level (unnamed) leaders will be different. There are three campaign and three raid scenarios, featuring many units for the longer games and fewer for shorter ones (280 counters total). 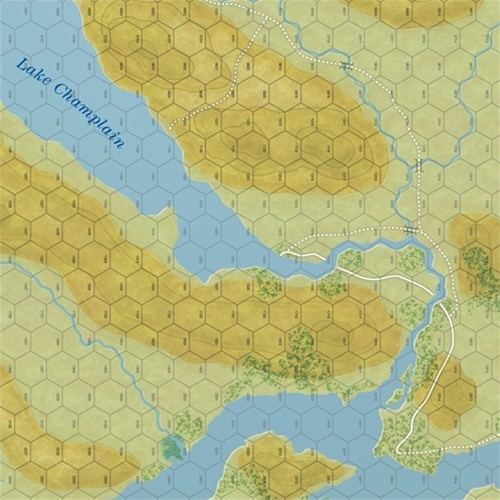 Each hex on the Strategic Map represents 1.5 miles, whereas each hex on the Tactical Map (for the area near Ticonderoga) represents just 400 yards. Individual units represent from 50 to 800 men, and leader chits each represent a single commander, sometimes a famous historical figure, at other times an unknown man of low-rank.